Strong, cast aluminium. 100mm jaw opening. 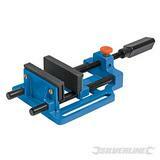 Quick release drill vice with tough hardened jaws. For drill stand or work bench. Release button for quick clamp action.